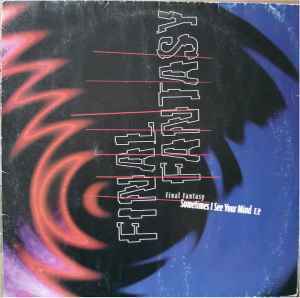 Final Fantasy ‎– Sometimes I See Your Mind E.P. think of Komakino (their alias) "Outface (G60-Mix)" without the breakbeats - simply wicked EP. There is an incredible remix of Track 2 "Sometimes" featured in Trancesylvania 2 and Techno Trax Vol. 9 compilations. The remix version although not credited as such is slightly different than the version featured on the CDM and the LP. It is more progressive and very powerful. The youtube video to the right with the LP image actually features the Remix version found in the compilations mentioned above. If you are looking for that particular version, this CD doesn't include it. The Remix version runs 6:37, original's run time is 6:13. Wonderful tracks! Fritsch and Hastik do know how to make a perfect hardtrance-tune. Listening to those tracks kicks me back into the great beginnings of hardtrance, when music was really fast and dreamy. Tracks by Final Fantasy and Komakino as well are milestones of music-history. I agree with neurodynamo, pitch the "Sky Is In Your Hands" down to -3 and you've got an incredible melodic and delicate trancer that overpowers me with emotion each time again! Beautiful old German trance and hard trance. Final Fantasy are better known as Komakino and although many might consider their anthems "Controlling Transmission and Outface" to be their best releases I would also strongly recommend listening to this EP as well. It contains some astonishing, tingling, eerie ambient synths and vocal samples layered over quality trance basslines. The piano lines on the "Sky is in your Hands" sounds so delicate and timeless at the same time. The other 2 tracks are also radiant gems and project your mind into an unreal, dreamlike state you won't want to leave anytime soon!